Cycling about in the snow/snowstorm has proved to have unexpected pleasures. 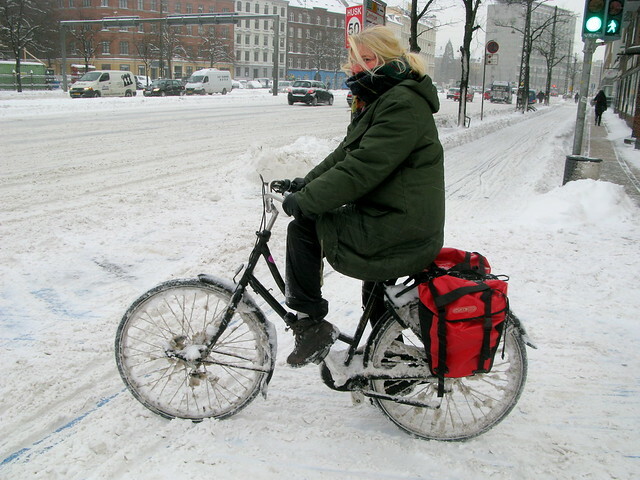 Cyclists braving the snowstorm enjoyed a certain sense of camaradie. I rolled to a stop at the light, above, and exchanged a smile and words with this fellow Copenhagener. "It's like living in another country..."
"The past is another country - They do things differently there." Greenland is not a country. Lol. I hope to see you documenting about biking in Montreal in winter. I love the fact that you guys continue to cycle in the snow. That's a great thing. Here in the UK when we have a small amount of snow everything grinds to a halt. Ho hum. "Greenland is not a country." Well, of course it's under the sovereignty of Denmark, but since 1979 it has been an autonomous country of the Danish Commonwealth. I'm old enough to remember when Canada didn't even have a flag. You go find a Canadian of about my age. If you can convince them that Canada wasn't a country when the flag was adopted, I'll give the thought that Greenland isn't a country another think. You're being a bit pedantic. A 'country' doesn't have to mean a political country or nation state. They are saying 'it is like another land' or 'it is like another place'. The pictures here are beautiful - would love to be in a country/land/place like that.